I just finished reading the book and just ordered my copy of Unscripted. This book was so informative and is already helping me in my journey to better myself. I can't wait to jump into Unscripted when it comes in. I finish reading The Millionaire Fastlane. Now I reread and take notes. 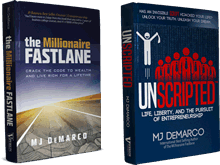 I've read Millionarie Fastlane and currently finishing Unscripted (for the second time - some information didn't stick from the first try or somehow slipped out of focus). The two most profound books I've read in my life (ok there was another one - second or third issue of Harry Potter that I killed in a single day). These books open your eyes and strike your entire beliefs system that was being constructed by your parents, society and god knows who else (but not you). richRich, MJ DeMarco and Doug-Parker like this. I'm reading it! I'm at chapter 27 and I can't wait to continue and finish it. Since I have purchased it, around a week ago, it has become one of my top priorities. So exciting to read! After having read the 4-hour workweek, many questions, uncertainties remained. And now, a new world of concrete principles is explained so clearly in the MFL that I can't resist the urge to write here already to tell you MJ thank you so much for it!!!!!!!!!!!!!!!!!!!!!!!!!! Apart 2-3 points that either I disagree or am not sure to agree regarding ethic/philosphy, I find everything so brilliant and it conforts me in my beliefs, while giving me the knowledge I was missing and the roadmap to drive fast AND securly on my road to being Rich! I can feel that I'm on the way to talk a lot already so I will keep the rest for my introduction,probably when I will finish the book. Thank you so much for your insights, I wish everyone could have access to them and help oneself with it! MJ DeMarco and Doug-Parker like this. 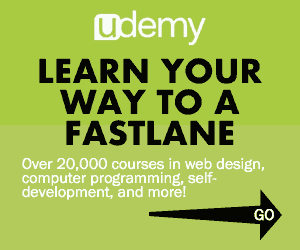 I’ve just finished the Millionaire Fastlane too and I can honestly say I wish I’d had this available 10 years ago. Great book, looking forward to starting. MJ DeMarco and LoveLife like this. I just finished reading TMF and I loved it! It really opened my eyes and changed my mindset! I'm planning to reread TMF again, to make sure I got everything correct and get unscripted next! Wrapped up the millionaire fastlane last night. I'm not blowing smoke, it was completely eye-opening. I feel like this stuff was right in front of me, but I couldn't see it until it was pointed out. Since I started it Wednesday, my thought process about business has changed and has been going a mile a minute. I've got a lot to think about. But it's time to plug my nose, grab my balls, and jump in. MJ DeMarco and I2KGhost like this. So, I just completed my first read of The Millionaire Fastlane, and all I can say is, "WOW. Just, WOW!" Was a sidewalker longer in my life than I'd like to admit, and right now I'm a slowlaner... I'm ready to make the change! MJ I must say you are a great person having great writing skill, wisdom & knowledge. I've finished reading TMF and learned so much from this book! Definitely a real eye-opener. I've read both Fastlane and Unscripted. Over the years I've read several thousand business books and these two are now my favorites. Thanks for the amazing insights. I've created more than 100 products and services for more than 50 client companies over the years and wish I'd understood Productocracy sooner. I'm sure that following that philosophy instead of creating $3.2 billion in sales I would have generated 10 times that amount. Creating only Productocracies will be my main goal going forward. MJ DeMarco and Chad like this. I read it a few years ago and it changed my perspective and mindset on life and in the way I want to pursue my ultimate goals in life. The introduction of and complete mindshift from slowlaner to fastlaner has forever impacted my life. I read The Millionaire Fastlane several months ago, did not even get half way through the book before I insisted that four of my coworkers bought copies. Since then I have decided on a single business concept started the re-read. And joined this forum. This is all life altering, I am anxious to see how far I can push this. I read TMF, confirmed a lot of my suspicions about true wealth and how to achieve it. MJ is a perfect person to learn from as he is essentially anti-guru and achieved his wealth from something besides being a guru which is a growing theme in the space these days in my opinion. Read it about a year and a half ago. I'm so glad I did and it changed my whole mindset, the way that I live every day and the way that I look the world! Thank you from the bottom of my heart, @MJ DeMarco ! I read it and it was good. Easily one of the best books I've ever read. The knowledge in here is priceless. The only business book that really stayed with me after I read it. Thanks MJ! I read it. Made lots of notes and underlined stuff. Great book and info!